…not that kind of booty! That booty! I’m talking about my loot! I had to re-up some of my stash today. Was completely out of my JBCO (which I ♥)! And only had maybe two fingertips of my curl pudding. That was definitely no bueno! So I had to make a quick run to the beauty supply store. In true form of a recovering PJ, I had to pick up something else! *SMH & hard side eye* I’ve been wondering how setting lotion would work on holding my curls so I decided to try it. Positive side – I ONLY grabbed one item instead of my typical hauls! *side eye subsiding and slight smile creeping in* Review of how the Lotta Body works will come soon. 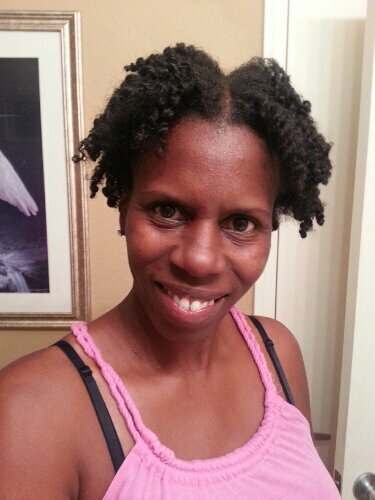 Two strand twist out – I like! It lasted all day! 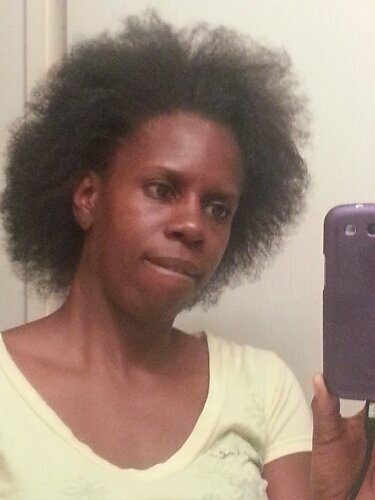 Yesterday was wash day but I didn’t do a shampoo wash, only a co-wash, so no ACV rinse this time. I did a combo deep condition and hot oil treatment as I’ve been doing for the past month or so. After washing, I used HH as my leave-in and I sealed with EVOO. 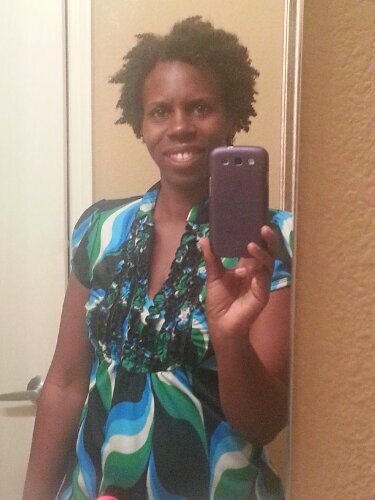 I used Elasta QP mango lime curl pudding and EcoStyler get to set my twists. To prevent residue and stiffness from the gel, I applied coconut oil right before twisting. I banded the roots for some stretch, but didn’t pin them. 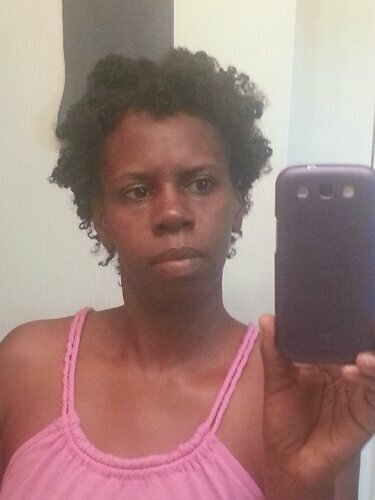 My curls were very defined this morning after untwisting. OK…so I’ve been re-nominated (is that even a word???) again for the Liebster Award by Stonidee, author of All Suga and Stone (Naturally) – http://1stonidee.wordpress.com. 3. Who is your “hero”? Why? 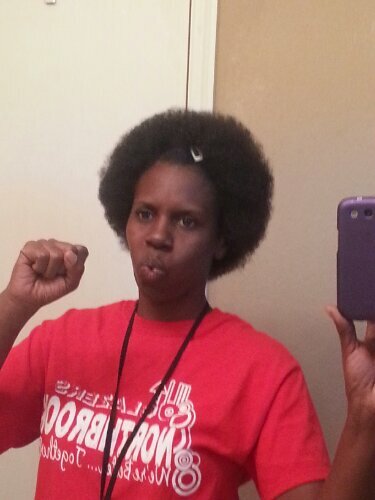 My mom is my hero because she was the epitomy of a strong, black woman. She was a single mother that me sure that we never went without. Growing up, I thought we were RICH. We weren’t destitute, but we were not as affluent as I thought we were in my young mind. In seeing her work hard to provide for us, I realized what it meant to be strong and independent. I was taught from an early age that there wasn’t anything that I couldn’t do. 4. Are you single and loving it, single and looking, casually dating, dating exclusively, married, or divorced? * If too personal just put a happy face, I’ll understand *I am recently separated after 14 years of marriage, well it has almost been a year. Is that still considered recent? :O Right now, I am single and adjusting I guess I should say. I won’t say that I’m loving it because I’m not. I’m a relationship type of girl and I enjoy having someone to share my life with. But, I’m not actively looking for another relationship. 5. What is your preference of weather? I love, love, love Fall. I love the beautiful colors that appear in the Fall, as well as the cool, crisp weather. 7. Movies… action, horror, comedy, drama, or thriller? Drama movies with a good plot and storyline. 8. If you suddenly had to change profession, what would you change to? If I would suddenly change careers, I would be a screenwriter or a forensic scientist. Since I recently (just last week) nominated others for this award, I don’t have any others will less than 200 followers to nominate, so I will be adding those same bloggers to this post as the nominees and the same questions. 1. What do you do for a living? 2. What do you like to do for fun? 3. Are you a glass half empty or half full type of person? 4. Cook or take out/eat out? 5. What are you passionate about? 6. Favorite season/time of year? 7. Do you collect anything? If so, what? 8. City life or country living? Why? This is my hair after I got home from work today! Curls still perfectly defined! Back to basics regimen is working! It did get a tad bit puffy, but not nearly as much as it did before. And it’s not in perfect form but I’m ecstatic that it the curls held up!!! On another note, I re-twisted my hair tonight. As I did so, I noticed that there was absolutely NO shedding! There were no little curly hairs on the floor, in the sink, nor on the countertop! This was a first! As Si from Duck Dynasty would say: Happy, happy, happy! I was home with a sick kiddo today and in my boredom I decided to play around with my hair. 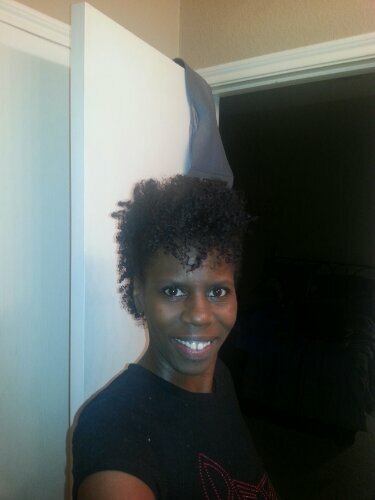 This is the outcome…a frohawk – another one of those styles that I swore I would never wear. I dusted my ends a tad last night as I twisted it and I’m noticing that my curls stayed defined and there is barely any frizz now. I kinda like it! I think I’m on to something! While reading several of the hair blogs that I frequent, I came across some info about hot oil treatments and deep conditioning. I realized that many naturals do these two steps BEFORE actually washing their hair. In my regimen, I’d always done them afterwards. After thinking about this, it made sense as to why reversing the order of these steps could be beneficial – the main reason being to provide a barrier on the hair to prevent the shampoo from stripping all of the oil from the strands and leaving them dry and brittle. 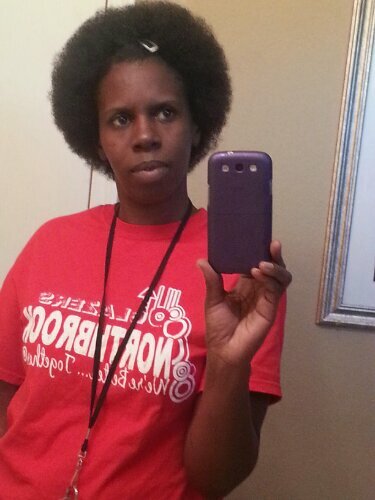 So, yesterday was wash day and I decided that I would try. 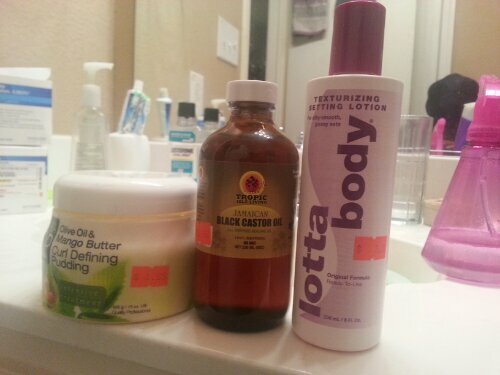 I pre-pooed with coconut oil, then did my hot oil treatment, and afterwards deep conditioned. Since I’d done a protein deep condition last week, I didn’t add the proteins this time. I’ve started alternating the protein deep condition every two weeks. I added the Aussie 3 Minute Miracle Deep Treatment to control frizz. I’m trying to determine if my hair likes this product. I did a clarifying wash this week because I had a lot of gel build up and conditioned using the Shea Moisture. When I did the ACV rinse, I let it sit for a couple of minutes before rinsing it out as I usually do. I finished by moisturizing and sealing and letting it air dry. When it was pretty much dry I attempted to do Bantu knots using Shea Moisture Curl Enhancing Smoothie and aloe vera gel. I could not get my Bantu knots to look like the ones on YouTube videos I’d seen, but I left them in anyway to see how it would turn out. Before untwisting I sat under the dryer for a few minutes because I went to the gym this morning and my head sweated as usual. When I untwisted, as I suspected, it didn’t turn out right. My hair was still damp! So I still don’t know if this style will work for me. But! My hair felt great! It was nice and soft and looked very moisturized. It had a nice sheen as well. 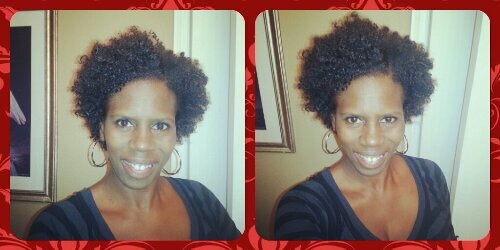 I think changing the order in which I did the hot oil treatment and deep conditioning made a difference. I will continue to do it this way. I two strand twisted it since the Bantu knots didn’t set. I’m realizing that it is true that we must continue to research, experiment, and change our regimens until we find the process that makes our hair look and feel its best. I’m learning more and more about my hair everyday. My hair is stretched due to the fact that I wore it in my faux bun on Thursday and today I pulled it back in a clip and let it hang in the back. It wasn’t a good look by the end of the day but I give myself kudos for stepping out of my box again to attempt a different style.